This Thing contains .stl files to print several 28mm scale upright Arcade Game Cabinets. 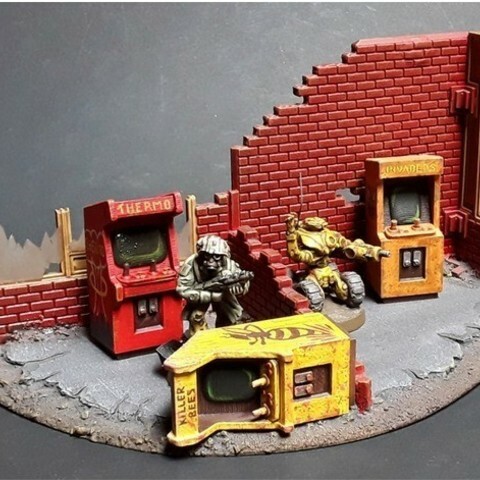 They're intended to add interesting scatter terrain to 28mm scale Science Fiction or Modern war games. In the files you'll find three upright Arcade Cabinets, and two Control files which will let you print a total of six different cabinet + control combinations. The Arcade Cabinets should load into your slicer so they are laying on their backs, with the screen and other details face up (in the Z axis). If not please rotate before printing. 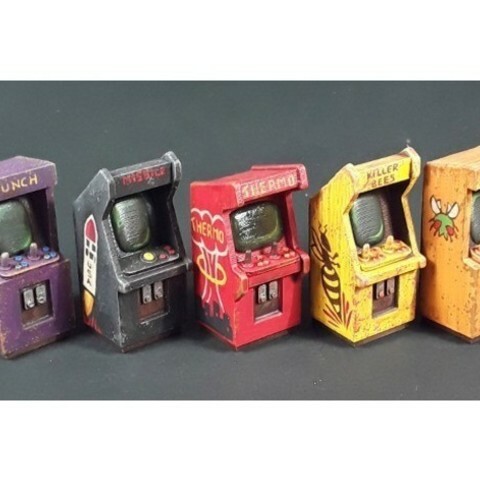 There's a generic cabinet design, and two designs inspired by classic 1980's Arcade games. The Controls are small separate prints that are designed to be glued to the printed cabinets. One is a classic two player joystick setup, and the other is a one player trackball design. As my printer isn't capable of particularly smooth first layers, I like to cover the back of each finished cabinet with some 0.1mm Plastruct plastic card. This gives the cabinet some simple extra detailing, and hides any print bed defects. Additionally, while painting the finished pieces, consider painting their bases as well. That way they can be flipped on their sides for lower horizontal cover for your war game. Gloss varnish also works nicely if applied to the screens once normal painting and varnishing is complete. I'm a hobbyist war-gamer based in New Zealand. I'm focused on creating original 3D designs for 28mm scale war-gaming that can print quickly and easily on low priced hobbyist consumer 3D printers. See www.tabletop-terrain.com for my designs in action on the war gaming table.